Surprisingly, the comparison of theoretical estimates from the inferred cooling history of the core with geological data from ancient rock records reveals a conundrum. The solid inner core came into being just around one billion years ago, while rock samples from a lot older (~3.5 billion years ago) show the magnetic imprint of an external magnetic field nonetheless! This is very weird, as you would guess that there was no magnetic field when Earth did not have the current energy source to drive the geodynamo, which generated the magnetic field. There was envisioned an alternate power source to bridge the time before the onset of the current driving mechanism: exsolution (release or transfer) of magnesium oxide from the core to the mantle. Usually, the core is supposed to be comprised mostly of heavy metals like iron and nickel. However, a massive giant impactor, like the one which likely formed the moon, could have injected enormous amounts of lighter elements into the core. When a giant impactor of at least a few percent of Earth’s mass crashes into the planet it will rapidly sink into the center of the Earth. The impactor itself has a core just like Earth and the two cores will merge. However, the sink velocity is so fast that elements which usually do not sit in cores will just follow the impactor core the Earth’s center. How does the added material release energy? 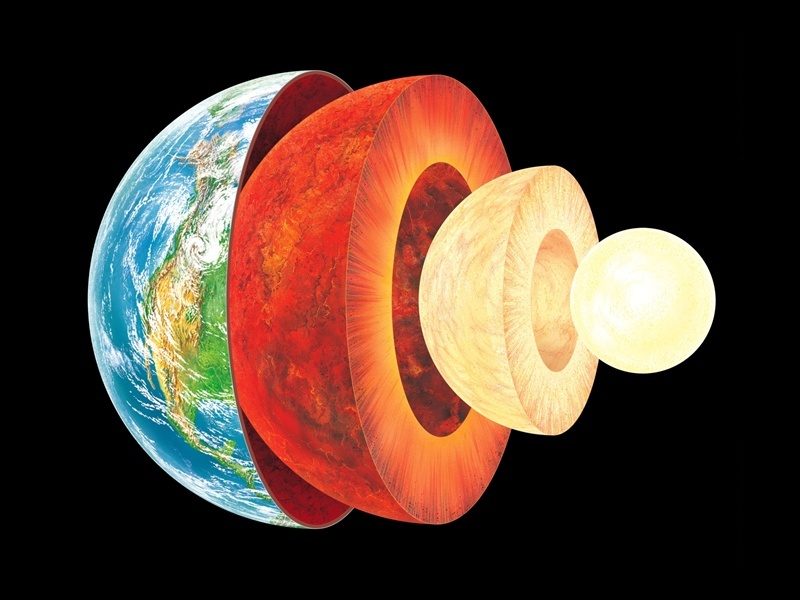 If you envision the scenario of an impactor core sinking down to Earth’s center and merging with the old core, an important questions arises: will the merge be perfect or will the added core-material just casually linger on top of the old core? We do not know the answer to this, as our understanding of material properties and physiochemical reactions under such extreme conditions are limited. Therefore, the authors tried out both extremes, as pictured in Figure 2. One extreme is complete and perfect mixing of the new core with old one. The other one is that the new core material just sinks onto the top of the old one and stays there. The difference in liberated potential energy from exsolution of magnesium oxide is quite different. This tells us that a different layering of the additional material changes the total energy output. But what if the total amount of added material is changed? Counter-intuitively, as shown in Figure 3, more magnesium oxide does not change the energy release. However, it does change the onset of the energy liberation. This is because the amount of magnesium oxide changes the cooling regime of the core and the onset of magnesium oxide exsolution into the mantle depends solely on core temperature. This means that the duration the dynamo can be powered by this mechanism varies, depending on the amount of added material. 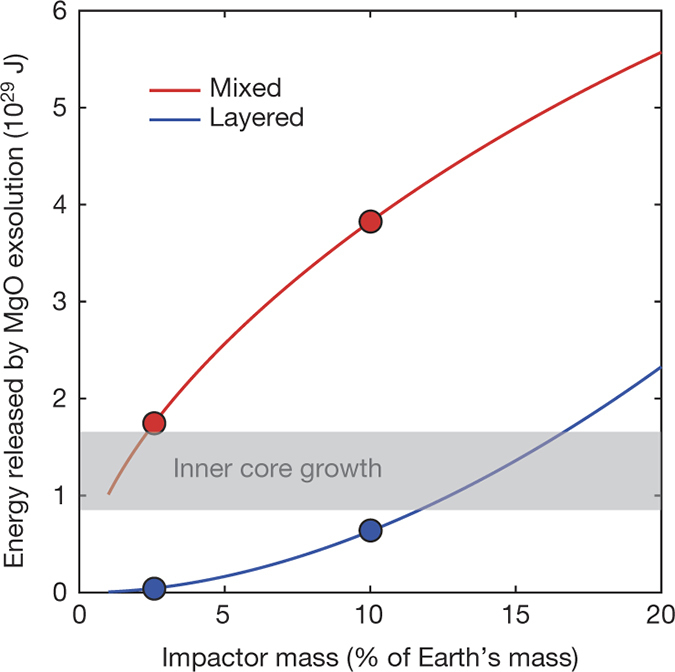 Thus, large impacts power longer-term dynamos than smaller impactors, all in relation to the total amount of material present in the planet before the giant impact. Featured image from this website. Not that geodynamo models aren’t fine-tuned like the one here, but the 1 Ga inner core result is dependent on a recently revised thermal conductivity estimate. [ http://adsabs.harvard.edu/abs/2015PEPI..247…36L ; the paper reference ] Has this become consensus, and how robust is it?